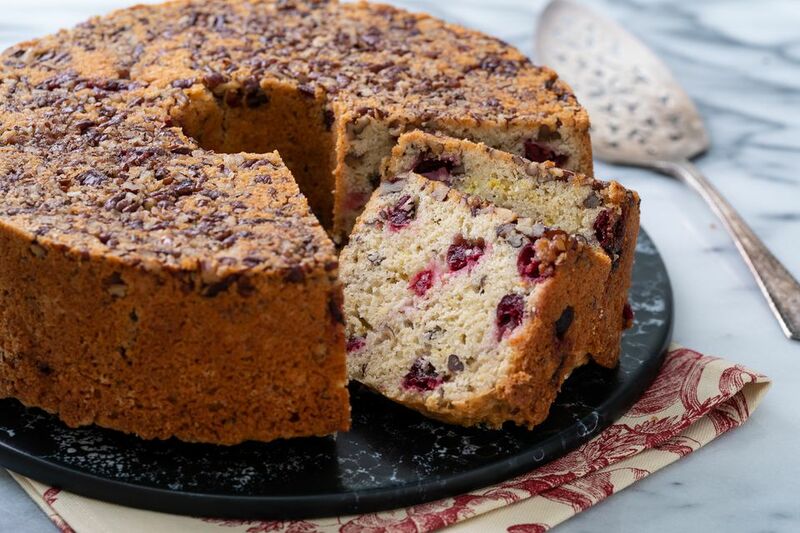 When planning your next brunch or afternoon tea, this elegant cranberry bread is the perfect make-ahead recipe that is sure to impress. It can be prepared with either fresh or thawed frozen cranberries. Sprinkle the tart cranberries with sugar to release their juices and balance out their flavor. Chopped pecans add texture and crunch to the bread, while fresh lemon zest brightens every bite. The delicate texture and nice crumb of this bread come from the technique of incorporating the shortening and with the dry ingredients using a pastry blender. This is a bit different from other quick-breads where the wet and dry ingredients are simply combined until moistened. Prepare this bread the day before you plan to serve it and then wrap it well once it has cooled completely. This allows the delicate flavors in the bread to meld together as it sits overnight. It also makes it easier to slice and serve the next day. Grease and flour a tube or Bundt pan, or coat with cooking spray. Sprinkle 1/2 cup of the pecans evenly over bottom of pan. Mix cranberries and 1/4 cup of the sugar in a small bowl; let stand while preparing batter. Sift flour, remaining 1 cup sugar, baking powder, and salt into a large bowl. Cut in shortening with a pastry blender or fork until mixture resembles a coarse meal. Stir in the remaining pecans and lemon zest. Add all at once to flour mixture; stir just until moist. Spoon onto prepared pan; spread top until even. Bake at 350 degrees F. for 1 hour and 10 minutes, or until a wooden pick inserted near center comes out clean. Cool in pan on a rack 10 minutes. Loosen around edge and center with knife; turn out onto rack. Cool completely. Wrap loaf tightly. Store overnight at room temperature to allow flavors to meld and make slicing easier. Use a pastry blender to cut in the shortening until it resembles a coarse meal. If you don’t have a pastry blender, two knives crisscrossed using a scissor-like motion can also work to cut the shortening into a flour mixture.